A perfect solution for simplifying telephony and data cable installations. 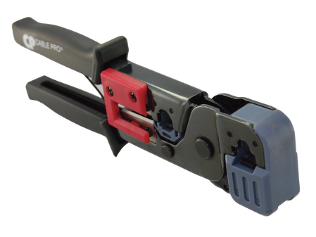 The CPRJ11-45 is a multi-function tool that allows professional installers the ability to cut, strip and crimp both RJ11 and RJ45 cable for installations that can benefit from easy one-tool applications. The tool is designed with a cable stop to ensure a perfect cable preparation each and every time. The installer has the option of 1/4” or 1/2” cable prep depending on the job requirement. The CPRJ11-45 offers the ability to cut, strip and crimp without having to change tool or die sets rendering it easy to use without compromising quality of the connection. It also features comfortable grip handles to reduce operator stress.